“Ambushed by Greed: The Chak Story" a weeklong photography exhibition by Philip Gain reveals an unprecedented ecological disaster and the misery of a people called the Chaks. Society for Environ-ment and Human Develop-ment (SEHD) organised the exhibition which started on June 23 at Drik Gallery at Dhanmondi. According to a government survey the number of this indigenous community in Bangladesh is 2,200 while SEHD statistics shows the number about 3000. The Chaks are truly a happy people in the forest villages and little known to the rest of the country. They live in 21 villages of Nikhyongchhari Upazila in the Bandarban Hill District. Agriculture is their sole livelihood. According to a SEHD survey among 449 families, 291 are dependent on agriculture, Jum farming for centuries. It is their traditional livelihood. Historically no exact boundary had been chalked out for Jum cultivation. 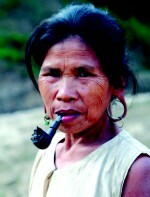 They used to maintain a Chhara, a common forest for them, to collect bamboo and wood. But the harmony and peace maintained by the Chaks have been seriously compromised by outsiders coming in and setting up rubber and tobacco monoculture, thus plundering every bit of natural resources from the Chak land. 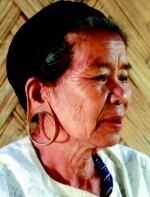 The Bengali settlement started in Bandarban district after 1980. Their lands are allocated for rubber plantation mainly among the Bengali people since then. The exhibition and the seminar on the starting day were organised to share images and information and to appeal to the state to stop destruction that comes along with the invasion of modern agriculture, in-migration and ill-conceived development strategies. CHTDB (Chittagong Hill Tract Development Board), district administration and standing community for rubber plantation control the usage of the land snatched from the Chak community people for rubber plantation and horticulture. According to the district administration source, 45,000 acres of land was given lease for commercial production of rubber and horticulture and most of the land was leased to Bengalis. Under a rehabilitation programme, CHTDB provided 2000 acres of land to 500 families of indigenous people, but none of these families received any document of those lands. Mong Mong Chak, a Chak community presented a paper at the seminar saying that they are not benefited by rubber plantation. The earnings from rubber plantation go to the Bengali land owners. The women of the Chak community feel unsafe for their free movement. The rubber plantations have disrupted the environment in other ways. Cows have died after consuming the rubber sap. Production of natural vegetation has decreased significantly after introducing rubber plantation in CHT creating a major interruption to indigenous life style. Not only natural vegetation, many wild animals have been lost from this area. Tiger and deer were available even ten years back in this area, but now they are just a memory. The administration itself is helping to evict the Chak community people here, said Philip Gain, an environmental journalist and activist, in his presentation at the seminar. Political intervention is essential here to solve these problems, he said. Philip Gain has been trekking through the remote Chak villages particularly in Baishari Union only to witness and record some of the devastating effects of rubber monoculture on the high land and tobacco on the precious bits and pieces of flat land along the streams that the Chaks have used to grow vegetables and other crops. The images that come from his trek through the Chak villages and the Chak land show how important it is to have the right state policy and action strategies in protecting nature and communities as vulnerable as the Chaks.